The Sound Town METIS-15SPW is a powerful yet portable 15" powered subwoofer that delivers earthshaking punchy lows to your live rig. It handles formidable 400 Watts RMS, 800 Watts peak power and reproduces low frequencies all the way down to 35Hz. With top-quality components built in and innovative technology engineered, the Sound Town METIS-15SPW subwoofer is second to none when it comes to adding massive bass to your PA system while it doesn't break your bank. The Sound Town METIS-15SPW subwoofer enclosure comes with a 5/8" plywood front and rear panels housing a powerful amp inside. This enclosure resists distortion even at extreme output level and guarantees stellar sound quality. It also comes with 2 XLR/TRS combo inputs, 2 XLR full-range pass-through outputs to accommodate almost everything and makes connection a breeze. It also features a pole-socket and so you can mount a main speaker on top. 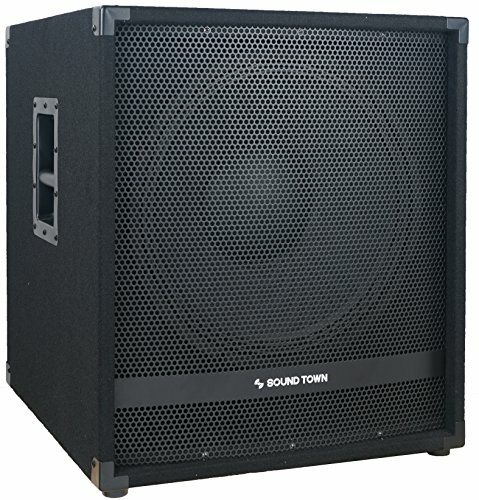 For ground-shaking bass reinforcement, check out the Sound Town METIS-15SPW powered subwoofer.